This is a really great series enjoyed by the entire family. Kids are drawn in due to their favorite characters in LEGO form, while adults love seeing Star Wars in a new way. I had not see The Freemaker Adventure season one and was still able to follow along with this series. The Freemakers are a family of three siblings who are scavengers of space junk, do repairs, and more. In season two they are in the Rebel fleet and have to stay true to their beliefs while trying to bring down the Imperial forces and save some of our beloved Star Wars characters. 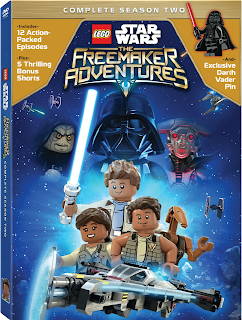 CREATORS/DIRECTORS: Developed for television by Bill Motz and Bob Roth ("Penguins of Madagascar"), they join Torsten Jacobson ("LEGO Star Wars: Droid Tales") and Jill Wilfert ("The LEGO Movie") as executive producers alongside producers Carrie Beck (Star Wars Rebels), Jason Cosler ("LEGO Marvel Super Heroes: Avengers Reassembled! "), Jake Blais and John McCormack. Guided by the company spirit: "Only the best is good enough”, the company is committed to the development of children and aims to inspire and develop the builders of tomorrow through creative play and learning. LEGO products are sold worldwide and can be virtually explored atwww.LEGO.com.